Ugh, it’s been too long. I’m done with work for the year though, so I’ll get some music posted in the next few days. 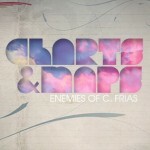 To start off with, here’s Charts and Maps with their release Enemies of C.Frias. It’s four tracks of a sort of art / jazz / rock type of sound, hard to classify really. They are all over the chord scale on every track, almost to the point of experimental music, but the songs remain structured and have just enough edge to make it a worthy listen. This entry was posted in Music and tagged art rock, Experimental, Jazz, Rock by bahgheera. Bookmark the permalink.